From the beginning, the development of the rifle has been motivated by the desire to project a force to a distance in an attempt to destroy something. The rifle is an offensive weapon that can be used for defense, although the shotgun would serve the purpose better, and a handgun is more comfortable to carry. Of the three types of weapon, only the better handguns for self defense should be carried on the body or stored in quick access safes with live ammunition in the chamber or barrel. To do so with a long gun invites an accidental discharge, because long gun safeties don't block their internal firing mechanisms. The rifle's size, a minimum of 16" barrel length, or its weight, typically six to eight pounds, requires forethought and considerable effort before it can be utilized. A defensive rifle may need to take advantage of its medium range capabilities with the use of an attached bipod, and it may benefit from a flash hider. Shooting in low light can reveal how well a suppressor works, and how the rifle's sighting system performs. Before firing any weapon, check to see that the barrel is clean and unobstructed and the chamber is free of dirt or oil. With a long sight radius or a scope, and a shoulder stock for support, the rifle is the easiest weapon to learn to shoot. The fundamentals of precision shooting apply to all weapons. Mastering trigger control is all important. Find a means to steady the weapon during the lock time, the time between the press of the trigger and the firing pin strike. Time the shot so the sights are lined up with the target at the firing instant. If the target is moving, very little lead is required with a rifle, but keep the gun swinging with the target, even after the shot. Some tests have shown that no bullet can buck brush all the time. A small diameter bullet may sneak through small holes in the brush, but if it touches so much as a twig, it can fly at a wild angle. A large bullet may not be affected as much by the twig, but it will lose it's stability and become unpredictable. A scope won't reveal nearby obstacles, so check visually. Always shoot though a clear path to avoid causing a stray bullet. As distance increases, other factors require aiming corrections, and a good rifleman knows, throughout the range, how trajectory, wind, angle, and mirage affect a particular bullet after it leaves the muzzle at a known velocity. To an experienced shooter, there is no such thing as a flat shooting cartridge. At normally short hunting and defensive ranges, all cartridges, even the slow ones, have very similar bullet path curves that are all nearly straight. At long ranges, where hunting should be attempted only by the best rifleman with a rest, all cartridges, even the very fast ones, have very quickly dropping bullet path curves. They are so different from each other that each bullet used has an unique trajectory for which allowances must be made. The old timer would lick his thumb, put it in the air, and consistently bring dinner home to the family. Of course, he had been doing just that every day since boyhood with the same rifle his grandfather had passed down to his dad. Today's rifles can handle challenges he would never have imagined. During the civil war, the best marksmen had to hit a three foot circle, three out of four times, at one thousand yards with their rifled, 58 caliber, black powder, muzzle loaders. Today groups under four inches at that range are being fired routinely. Recently a marine sniper in Iraq killed the crew of an insurgent mortar across the river at 1050 yards. Rifles of different lengths, weights, and calibers can be found for most applications, but to choose one rifle to do everything would involve compromises. Decide whom the users will be to determine any size, weight, and recoil limitations. Decide what the bullet needs to accomplish to determine its weight, construction, and terminal velocity or power. Decide what ranges are involved to determine bullet shape and initial velocity requirements. Lighter bullets can be driven faster with less perceived recoil. They may have the same energy as heavy, slower bullets, but they may not have as much momentum to knock down larger game quickly. A heavier rifle spreads the recoil impulse over a greater time and seems to soften it, but lugging a ten pound target gun up a mountain is a workout. A longer barrel imparts more velocity and energy to the bullet, but it could be a handicap when crawling through thick brush. Recoil dampers inside the stock make a light rifle act like a heavy one. Muzzle brakes vent the blast back toward the shooter and bystanders, so the reduction in recoil they provide comes at some social cost. Single shot rifles can have the strongest action, while their weight and overall length is lighter and shorter. They are the easiest to clean, and have the capacity to be the most accurate of all actions. Double rifles are much more expensive because both barrels must be regulated to hit the same spot. Some big game hunters take comfort in knowing they have two quick, dependable shots available. Bolt action rifles are very strong, and when chambered for the shorter cartridges, they can have a shorter, stiffer action which may contribute to accuracy. A short, fat, heavy barrel, with or without flutes, can be more accurate, because it dampens the oscillations and whip caused by the accelerating bullet. A detachable magazine makes loading and unloading easier, but it could drop in the dirt or be lost without extra precaution. The bolt action rifle is chosen by most hunters of large, dangerous game, because it is simple and reliable. Semiautomatics function best with middle power loadings and require more effort to clean. A clean action, chamber, and ammunition are a must for reliability. Loadings that are too light may not have enough power to cycle the action, and the high pressures of heavy loads may seal the brass case inside the chamber wall too long and prevent the extractor from removing it. In cold weather, replace all traces of oil on moving parts with Rem-Oil or a silicone substitute. When a semiautomatic is fired repeatedly, the chamber and barrel can become so hot that a cartridge can cook off, or fire by itself, if left in battery. An advantage to this action is that the extra parts moving back and forth seem to soften perceived recoil. Lever actions have been a favorite in the woods since the end of the civil war. The 30-30 was the first cartridge developed exclusively for modern smokeless powder. It has killed, and wounded, more deer than any other cartridge to date. Modern lever actions can handle powerful calibers, but they all require extra care loading and unloading. In tubular magazines, each cartridge nose should be flat where it pushes against the bottom of the cartridge ahead of it. Unfortunately, flat nosed bullets shed their velocity and energy quickly. Though, at close ranges, bullet shape isn't as important as bullet weight and construction. In return for the punishment the shooter endures from the more powerful calibers, not much energy is left at longer ranges if the bullet is fat, short, round or flat nosed. The longer, pointed, boat tail bullets have the highest coefficient of efficiency and the least drag for long range projection of power. For example, although the tremendous short range power of the large bore 458 Winchester Magnum is twenty-five percent greater at the muzzle than that of the medium bore 338 Winchester Magnum, the declining energy of the larger bullet is surpassed within three hundred yards by the sleeker 338. In fact, a heavy 338 bullet will deliver more energy far downrange than almost any other caliber. Some small bore bullets in 7mm and 30 caliber have a slightly better coefficient of efficiency, but because they are lighter than the medium bore bullets, they can't be driven with as much initial momentum or energy. Those who wish to learn to shoot the 338 should keep a .22 caliber ready for practice when signs of flinching appear. An SKS or AK semi-auto rifle in 7.62 X 39 caliber makes a compact, low cost, and easy to shoot survival weapon for close range medium size game. A low power scope should have see through mounts for use of the iron sights. 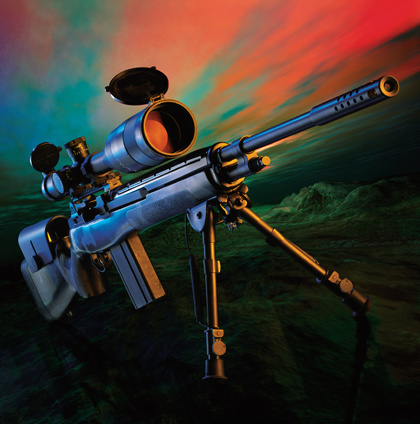 Close range, as defined by the rifle's ultimate potential, may be considered to be 100 yards or less. Accuracy tests are usually conducted at this range, because most shooting facilities have at least this capacity. The rifle is rested on sandbags positioned on a bench so that external forces are eliminated, save for the press of the trigger. Excellent portable rests are available that also may be used for rifle maintenance. The spread, or distance between the centers of the most separated holes of a three to ten shot group, indicates the intrinsic accuracy of the rifle. One ragged hole of ten shots at 100 yards has been achieved by a custom .308 with careful hand loads, but the majority of rifles with factory ammunition are considered to be very accurate when they can produce groups of one inch. At 100 yards, a minute of angle is 1.047 inch, and most scope adjustments use four to eight clicks per minute. The military uses a system called mil radians. Technically, the term means one thousandth of the range, but in practice, the circumference of a circle, using the range as the radius, is divided by 6400. At 100 yards, a mil is 3.5343 inches. Military and surplus rifles will generally shoot into a mil. A mil dot scope uses a cross of precise dots to help the rifleman hold for windage and elevation without adjusting the scope. Close range bench resting is a sport at which women often surpass men. From the bench, hunters gain confidence when they check their sight or scope alignment and see a nice tight group. To be practical, a group should be fired, one shot at a time, from a freshly cleaned, cold barrel. The center of such a group may be called the field point of impact, and it can be adjusted one or two inches high at 100 yards so the bullet will drop back to the line of sight at approximately 200 or 300 yards. One or two inches won't affect 100 yard shooting as much as human error. Jeff Cooper's book, The Art of the Rifle, is highly recommended. Practice free standing, offhand snap shooting to discover the longest effective field range at which an intended target size can be hit with certainty. Practice offhand, deliberately aimed shooting with a follow up shot. Practice kneeling, sitting, and prone. Try using shooting sticks, bipod, backpack, sling, and other rests. Shoot left and right around trees and walls for cover and stability, ensuring the rifle doesn't contact the rest directly, and the shoulder is free to move back with recoil. The effective field group and effective field point of impact are thus revealed for each position. A decision not to shoot past effective field range or under adverse conditions marks a true sportsman. The ultimate range of any rifle rests more with the ability of the shooter than with the accuracy of the rifle, size of the target, or the power of the cartridge. For defense or medium size game, the 30-30 and 7.62 x 39 will just suffice. Their power wanes or their groups spread apart, limiting their effectiveness beyond short ranges. Smaller calibers will work for defense or for varmints and small game as long as the effective field group can justify their use. Large bores and heavy bullets are recommended for close range defense against dangerous fauna like moose in rut and bear just out of the den, feeding, or with cubs. Predatory cats remain problematic, because their stealth and pounce leave little time to field any arm. Winchester's Model 100 auto loader in .308 is lightweight and powerful enough for medium game at medium ranges. The medium power scope uses a tip off mount for use of the iron sights. For arbitrary definition, medium ranges are 300 yards or less. This is well beyond the need for defense, so here the rifle is used for offense or hunting. A good riflemen can maintain an effective field group, using a steady position or rest, with average rifles sighted in slightly high at 100 yards. This allows a dead on hold for a nine inch target throughout the range. The large bore, slower bullets start dropping enough at the end of the medium ranges so that some trajectory correction should be made. However, most medium range misses are from holding too high or leading too much in an attempt to help the rifle. "Hold on hair," is a hunting rule often quoted for this range. The medium power cartridges like the .308 and 30-06 case families all work for medium game. For larger elk, moose, and bear, choose the magnum cases up to the .338 or 375 Holland and Holland. Premium bullets with sufficient terminal momentum are recommended, and a few groups fired at the limit of this range will build confidence and a sense of achievement. This Ruger M77 bolt action will hit long range targets with the proper handloads. The barrel is a custom stainless Magnaported .338 Magnum. The greatest challenge for an expert rifleman is to hit at long range. Many factors must be mastered to attain consistently small groups at ranges up to 1000 yards. A rifle that can produce one inch groups at 100 yards may not be able to keep all its shots inside a 15 inch circle at 1000 yards. At that range, even the most efficiently shaped bullets will lose three quarters of their starting, or muzzle energy. The smallest crosswind somewhere in the middle of the range will have a pronounced affect at the target. The trajectory is dropping so fast that an error as small as 10 yards in estimated range can cause a miss. Laser rangefinders are helpful, but pacing down a power line or field and marking ranges is preferred. When shooting up or down at an angle, the actual range to use is only the horizontal separation between muzzle and target, not the apparent distance. Nevertheless, one of the better shooters in the club was able to drop two large bull elk with two shots from over 700 yards with his .338 Winchester Magnum. A medium to high power mildot scope on a target of known size can be used to estimate range within a few yards at 1000yards as well as the correct holdover and windage or lead for a moving target. Click here for a free link to see how easy it can be learned. Fine optics and an affordable price make the Nikon Monarch (#8423) 4-16 x 42mm SF matte mildot the scope to beat. The Mildot Master, calculates firing solutions. Please call or email for wholesale plus prices.